Leading Manufacturer of plastic door caps from Rajkot. Our reputation in the market is largely attributable to our precision-designed Plastic Door Caps from our wide collection of products. Offered door caps are manufactured using excellent quality plastic and advanced technology by our adept professionals. 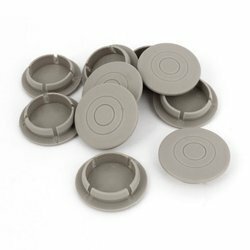 Our provided door caps are widely used in various furniture industries owing to their premium quality. Apart from this, crack resistance and sturdiness increase the demand for these door caps in the market.